Baths - The Portfolio Group, Inc. The project examples below are of master baths and powder rooms, both of which should be among the “special” spaces of a residential project. 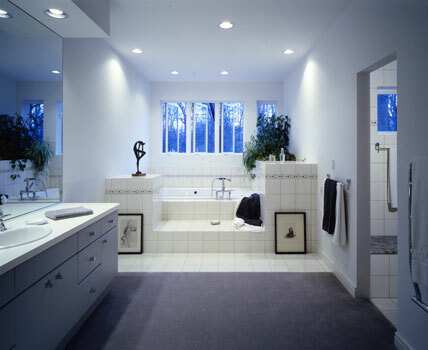 Each places an architectural emphasis on presentation as one enters and on careful composition of bathroom elements. All of the master baths capture feature views of their unique sites. A LODO Getaway. The symmetric composition of this master bath and shower captures views of the Rocky Mountain Front Range and beyond in one stroke. 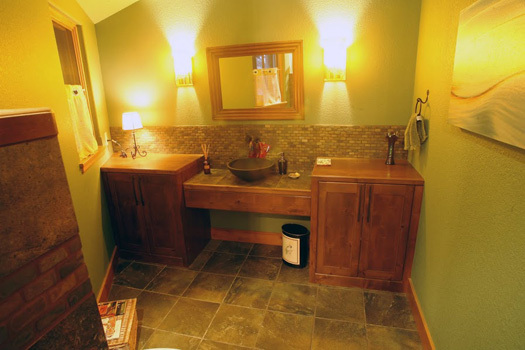 Bath appointments include Douglas fir flat panel cabinets, a combination of tile and wood countertops, stainless steel fixtures, and a timbered ceiling. 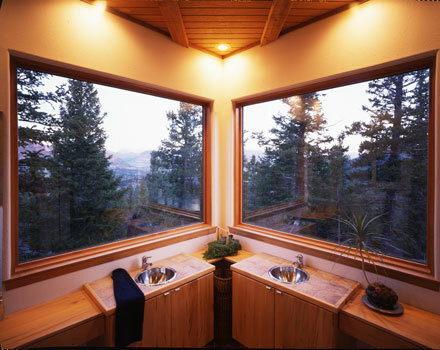 This master bath won Mountain Living magazine’s “Bath of the Year” contest, featured as "A Shower with a View". A LODO Getaway. 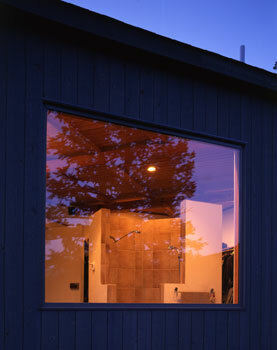 The "Shower with a View" is a free-standing tile shower with dual shower fixtures. Here it is pictured from the exterior, with a hint of the timbered ceiling visible above. For a better understanding of this overall master bath composition, view the left "pod" in the LODO Getaway Floor Plan. Bluff Lodge. 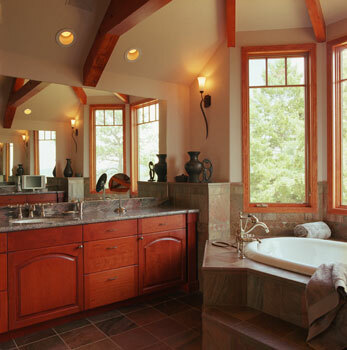 This expansive master bath features a vaulted timbered ceiling and bay window arrangement enclosing the whirlpool tub and displaying views to the Rocky Mountains. Mountain Legacy. 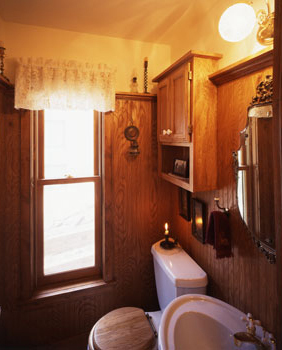 This powder room replicates the classic assembly of a Big Thompson Canyon cottage: beadboard wall to wall, a “knick-knack” shelf above, double-hung window, vintage wood-seat toilet, and vintage pedestal sink. Twin Lambs Ranch. The view from the shower of this expansive master suite captures views of the Front Range Rockies and an adjacent garden room. 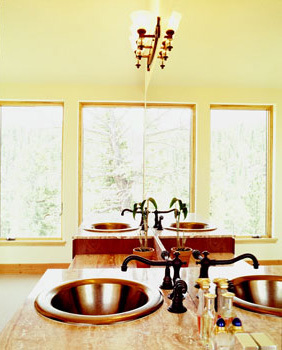 Oil-rubbed bronze dual shower fixtures and the Douglas fir-and-iron trussed ceiling treatment are repeated in the vanity area adjacent (see next below). Twin Lambs Ranch. Twin vanities include oil-rubbed bronze faucets, copper sinks, and granite counters. This project was featured as “Mountain Magic” in Log & Timber Style magazine. Aspen Valley Ranch. The orderly compostion of this generous powder room presents twin alderwood cabinets and a stone vessel sink with a wall-mounted oil-rubbed bronze faucet. Above is a “brick-tiled” backsplash and an antique mirror flanked by Tiffany wall sconces. Mountain Bungalow. 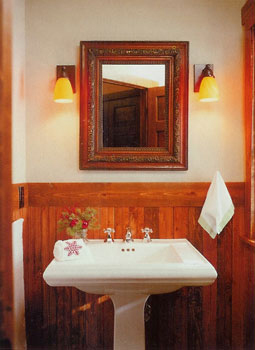 This powder room is just off the inviting entrance (see Interior Details) to this rustic Rocky Mountain cabin. It features beadboard wainscoating, a vintage pedestal sink, and an antique mirror. Ravine Forest. In this very expansive master bath, one can first bathe in the sumptous whirlpool space along the ravine, then retire to the steam shower at the right.